What think ye of Christ? Whose son is he?" The question that our Lord Jesus puts here to the Pharisees is the most fundamental question concerning Christian thought and faith that can be put to anybody in any age. Jesus Christ Himself is the center of Christianity, so the most fundamental questions of faith are those that concern the Person of Christ. If a man really holds to right views concerning the Person of Jesus Christ, he will sooner or later get right views on every other question. If he holds a wrong view concerning the Person of our Lord Jesus Christ, he is pretty sure to go wrong on everything else sooner or later. "What think ye of Christ?" That is the great central question; that is the vital question. And the most fundamental question concerning the Person of Christ is, Is Jesus Christ really God? Not merely, Is He Divine, but, Is He actually God? So our subject is not the Divinity of Christ, but the Deity of Christ; and our question is not, Is Jesus Christ Divine, but rather, Is Jesus Christ God? Was that Person Who was born in Bethlehem two thousand years ago, and Who lived thirty four years hereupon earth as recorded in the four gospels of Matthew, Mark, Luke and John, Who was crucified on Calvary's cross, Who rose from the dead the third day, and was exalted from earth to heaven to the right hand of the Father; was He God manifest in the flesh, was He God embodied in a human being? Was He, and is He, a Being worthy of our absolute faith and supreme love and our unhesitating obedience and our whole hearted worship. Should all men honour Jesus Christ even as they honour God the Father (John 5:23). Not merely is He an example that we can wisely follow, or a Master whom we can wisely serve, but is He a God Whom we can rightly worship? Most of us do believe that He was God manifest in the flesh and that He is God today at the right hand of the Father, but why do you believe so? Are you so intelligent in your faith, and therefore, so well-grounded in your faith that no glib talker or reasoner, no Unitarian or Russellite (JW) or Christian Scientist or Theosophist, or other errorist can confuse you and upset you and lead you astray? We are distinctly told in John 20:31 that "these are written, that ye might believe that Jesus is the Christ, the Son of God; and that believing ye might have life through his name." It is evident from these words of the inspired apostle John that this question is not merely a matter of theoretical opinion, but that it is a matter that concerns our salvation. It is to confirm and instruct you in your blessed faith, your saving faith in Jesus Christ as a Divine Person. The first line of proof of the absolute Deity of our Lord Jesus is that many names and titles clearly implying Deity are used of Jesus Christ in the Bible. Revelation 1:17, "And when I saw him, I fell at his feet as dead. And he laid his right hand upon me, saying unto me, Fear not; I am the first and the last." The text shows clearly that our Lord Jesus was the speaker, and here our Lord Jesus distinctly calls Himself "The First and the Last." In Isaiah 44:6 we read, "Thus saith the Lord the King of Israel, and his redeemer the Lord of hosts; I am the first, and I am the last; and beside me there is no God." In Revelation 22:12, 13, our Lord Jesus says that He is the Alpha and Omega. His words are, "And, behold, I come quickly; and my reward is with me, to give every man according as his work shall be. I am Alpha and Omega, the beginning and the end, the first and the last." Now in this same book in the first chapter and the eighth verse the Lord God declared that He is the Alpha and the Omega. His words are, "I am Alpha, and Omega, the beginning and the ending, saith the Lord, which is, and which was, and which is to come, the Almighty." In I Corinthians 2:8, the apostle Paul speaks of our crucified Lord Jesus as "The Lord of glory." His exact words are, "Which none of the princes of this world knew: for had they known it, they would not have crucified the Lord of glory." There can be no question that "The Lord of glory" is Jehovah God, for we read in Psalm 24:8-10, "Who is this King of glory? The Lord strong and mighty, the Lord mighty in battle. Lift up your heads, O ye gates; even lift them up, ye everlasting doors; and the King of glory shall come in. Who is this King of glory? The Lord of hosts, he is the King of glory. Selah." And we are told in the passage already referred to that our crucified Lord Jesus was the King of glory; therefore, He must be Jehovah. In John 20:28 Thomas addressed the Lord Jesus as his Lord and his God: "And Thomas answered and said unto him, My Lord and my God." Unitarians have endeavored to get around the force of this utterance made by Thomas by saying that Thomas was excited and that he was not addressing the Lord Jesus, but was saying "my Lord and my God" as an expression of astonishment, just the way that profane people sometimes use these exclamations today. But this interpretation is impossible and shows to what desperate straits the Unitarians are driven, for Jesus Himself commended Thomas for seeing it and saying it. Our Lord Jesus' words immediately following those of Thomas are, "Thomas, because thou hast seen me, thou hast believed: blessed are they that have not seen, and yet have believed" (John 20:29). In Titus 2:13 our Lord Jesus is spoken of as our "great God and our Saviour Jesus Christ." In Romans 9:5 Paul tells us that "Christ came, who is over all, God blessed forever." The Unitarians have made desperate efforts to overcome the force of these words, but the only fair translation and interpretation of these words are found in our Authorized Version. There can be no honest doubt to one who goes to the Bible to find out what It actually teaches, and not to read his own thought into It, that Jesus is spoken of by various names and titles that beyond a question imply deity, and that He in so many words is called God. In Hebrews 1:8 it is said of the Son, "But unto the Son he saith, Thy throne, O God, is for ever and ever: A sceptre of righteousness is the sceptre of thy kingdom." If we should go no further it is evidently the clear and often repeated teaching of the Bible that Jesus is really God. Another line of proof that Jesus Christ is God, a proof equally convincing, and that is, all the five distinctively Divine attributes are ascribed to Jesus Christ, and "all the fulness of the Godhead" is said to dwell in Him. There are five distinctively Divine attributes that God alone possesses. These are Omnipotence, Omniscience, Omnipresence, Eternity and Immutability. Each one of these distinctively Divine attributes are ascribed to Jesus Christ. First of all, omnipotence is ascribed to Jesus Christ. Not only are we taught that Jesus had power over diseases and death and winds and sea and demons, that they were all subject to His word, and that He is far above all principality and power and might and dominion and every name that is named, not only in this world, but also in the world to come (Eph. 1:20-23). Ephesians 3:20-"Now unto him [Christ] that is able to do exceeding abundantly above all that we ask or think, according to the power that worketh in us." Philippians 3:20-21-"...the Lord Jesus Christ: Who shall change our vile body, that it may be fashioned like unto his glorious body, according to the working whereby he is able even to subdue all things unto himself." Colossians 2:10-"Ye are complete in him, which is the head of all principality and power." Revelation 1:8-"I am Alpha and Omega, the beginning and the ending, saith the Lord, which is, and which was, and which is to come, the Almighty." Revelation 2:26-27 And he that overcometh, and keepeth my works unto the end, to him will I give power over the nations: And he shall rule them with a rod of iron; as the vessels of a potter shall they be broken to shivers: even as I received of my Father. We are taught in the Bible that Jesus knew men's lives, even their secret history (John 4:16-19), that He knew the secret thoughts of men, knew all men, knew what was in man (Mark 2:8; Luke 5:22; John 2:24, 25), which knowledge we are distinctly told in 2 Chronicles 6:30 and Jeremiah 17:9-10, that God alone possesses. We are told in so many words in John 16:30 that Jesus knew "all things," and in Colossians 2:3 we find that in Him "are hid all the treasures of wisdom and knowledge." Matthew 12:25-"Jesus knew their thoughts." Matthew 27:18-"For [Jesus] knew that for envy they had delivered Him." Luke 6:8-"He knew their thoughts." John 2:24-25-"But Jesus did not commit himself unto them, because he knew all men, And needed not that any should testify of man: for he knew what was in man." John 21:17-"And [Peter] said unto him, Lord, thou knowest all things; thou knowest that I love thee." Revelation 2:23-"... and all the churches shall know that I am he which searcheth the reins and hearts: ..."
We are told in Matthew 18:20 that where two or three are gathered together in His Name, that He is in the midst of them, and in Matthew 28:20 that wherever His obedient disciples should go, He would be with them, even unto the end of the age, and in John 14:20 and 2 Corinthians 13:5 we are told that He dwells in each believer, in all the millions of believers scattered over the earth. In Ephesians 1:23 we are told that He "filleth all in all." Matthew 18:20-"For where two or three are gathered together in my name, there am I in the midst of them." At any given moment there are literally thousands upon thousands of Bible studies, prayer meetings and church services being conducted around the earth. Jesus Christ says that He is present at each gathering. Only God can be at thousands of different places at the same time. Romans 8:10-"And if Christ be in you, the body is dead because of sin; but the Spirit is life because of righteousness.... [H]e that raised up Christ from the dead shall also quicken your mortal bodies by his Spirit that dwelleth in you." No created being, no matter how great, can dwell in the millions of Christians throughout the world; it is impossible. But it is not impossible for Jesus Christ who is God. 1 Corinthians 10:4-"And did all drink the same spiritual drink: for they drank of that spiritual Rock that followed them: and that Rock was Christ." Whenever believers partake of the Lord's Supper, Jesus Christ is spiritually present. Revelation 2:1-"These things saith he that holdeth the seven stars in his right hand, who walketh in the midst of the seven golden candlesticks." Jesus Christ is presented in Revelation as being present in the churches and being totally aware of each church's deeds in minute detail. We are told in John 1:1 that "in the beginning was the Word, and the Word was with God, and the Word was God." In John 8:58 Jesus Himself said, "Verily, verily, I say unto you, Before Abraham was, I am." Note that the Lord Jesus did not merely say that "before Abraham was I was," but that "before Abraham was, I AM," thus declaring Himself to be the eternal "I AM." Isaiah 9:6-"For unto us a child is born,...and his name shall be called Wonderful, Counsellor, The mighty God, The everlasting Father...."
John 1:1-3-"In the beginning was the Word, and the Word was with God, and the Word was God. The same was in the beginning with God. All things were made by him...." Jesus Christ existed with God prior to creation. John 8:58-" Jesus said unto them, Verily, verily, I say unto you, Before Abraham was, I am." Jesus certainly did not mean He existed as the first created being, because the Jews wanted to stone Him for claiming to be God. Revelation 1:8-"I am Alpha and Omega, the beginning and the ending, saith the Lord, which is, and which was, and which is to come, the Almighty" (cf. Rev. 22:13). His immutability is also taught in Hebrews, and in the first in verses eleven and twelve, we find that while even the heavens change, the Lord Jesus does not change. The exact words are, "They shall perish; but thou remainest; and they all shall wax old as cloth a garment; And as a vesture shalt thou fold them up, and they shall be changed: but thou art the same, and thy years shall not fail." Hebrews 13:8-"Jesus Christ the same yesterday, and to day, and for ever." This passage disproves the idea that Jesus is a created being. For if Jesus was created, He was not the same yesterday. "Yesterday" (past) is contrasted with "forever" (future), and obviously refers to eternity past. The Bible teaches that God created everything that exists, whether spiritual or material. "God that made the world and all things therein, seeing that he is Lord of heaven and earth, dwelleth not in temples made with hands" (Ac. 17:24). "Thou art worthy, O Lord, to receive glory and honour and power: for thou hast created all things, and for thy pleasure they are and were created" (Rev. 4:11). "[Him] that liveth for ever and ever, who created heaven, and the things that therein are, and the earth, and the things that therein are, and the sea, and the things which are therein..." (Rev. 10:6). Yet the Bible also teaches that Jesus Christ created everything. This can only mean that Jesus Christ is God the second Person of the trinity, for only God who is uncreated has the power to create from nothing. The Bible teaches that creation from nothing was an act of the triune God. That explains why Genesis 1:26 says, "Let us make man in our image, after our likeness." Following are some verses of Scripture which teach that Christ is the Creator. John 1:2-3-" The same was in the beginning with God. All things were made by him; and without him was not any thing made that was made." John 1:10-"He was in the world, and the world was made by him, and the world knew him not." 1 Corinthians 8:6-"But to us there is but one God, the Father, of whom are all things, and we in him; and one Lord Jesus Christ, by whom are all things, and we by him." Colossians 1:16-17-"For by him [Jesus Christ] were all things created, that are in heaven, and that are in earth, visible and invisible, whether they be thrones, or dominions, or principalities, or powers: all things were created by him, and for him: And he is before all things, and by him all things consist." Hebrews 1:2-3-"...his Son, whom he hath appointed heir of all things, by whom also he made the worlds; Who being the brightness of his glory, and the express image of his person, and upholding all things by the word of his power...."
Hebrews 2:10-"For it became him, for whom are all things, and by whom are all things...."
Hebrews 3:3-4-"For this man [Jesus Christ] was counted worthy of more glory than Moses, inasmuch as he who hath builded the house hath more honour than the house. For every house is builded by some man; but he that built all things is God." The Bible teaches that on the last day of this age God will judge all men who ever lived. "Then shall the trees of the wood sing out at the presence of the LORD, because he cometh to judge the earth" (1 Chr. 16:33). "And I saw the dead, small and great, stand before God; and the books were opened...and the dead were judged out of those things which were written in the books, according to their works" (Rev. 20:12). Only God is capable of judging all men. God is all-knowing and therefore knows every act. He is all-powerful, and therefore can carry out His punishments. He is perfectly holy and therefore can judge every sin without injustice. Only God who is moral and just in character has the authority to judge the human race. Yet the Bible teaches that Jesus Christ will judge the world. Christ Himself claimed the total authority and jurisdiction over mankind on the final day that can only belong to God. In fact, the judgment seat of God Almighty and the judgment seat of Jesus Christ are one and the same seat. Jesus said, "Many will say to me in that day, Lord, Lord.... And then will I profess unto them, I never knew you: depart from me, ye that work iniquity" (Mt. 7:22-23). The fate of each and every person rests upon Christ's decision; He has the power and authority to render sentence and to cast men into hell-an authority reserved exclusively to God. Following are some biblical references which unmistakably establish that Jesus Christ is the Judge of all mankind. Matthew 25:31-33, 41-"When the Son of man shall come in his glory, and all the holy angels with him, then shall he sit upon the throne of his glory: And before him shall be gathered all nations: and he shall separate them one from another, as a shepherd divideth his sheep from the goats: And he shall set the sheep on his right hand, but the goats on the left.... Then shall he say also unto them on the left hand, Depart from me, ye cursed, into everlasting fire, prepared for the devil and his angels." John 12:48-"He that rejecteth me, and receiveth not my words, hath one that judgeth him: the word that I have spoken, the same shall judge him in the last day." Acts 10:42-"And he commanded us to preach unto the people, and to testify that it is he which was ordained of God to be the Judge of quick and dead." Acts 17:31-"He hath appointed a day, in the which he will judge the world in righteousness by that man [Jesus Christ] whom he hath ordained." Romans 2:16-"In the day when God shall judge the secrets of men by Jesus Christ...."
Romans 14:10-12-"But why dost thou judge thy brother? or why dost thou set at nought thy brother? for we shall all stand before the judgment seat of Christ. For it is written, As]I live, saith the Lord, every knee shall bow to me, and every tongue shall confess to God. So then every one of us shall give account of himself to God." This passage of Scripture not only presents Christ as Judge, but clearly teaches that on the day of judgment everyone will bow to Christ; that is, everyone will acknowledge that Christ is the LORD God. By introducing his quotation of Isaiah 45:23 with the familiar prophetic formula, "As I live, saith the LORD" (cf. Num. 14:28, Isa. 49:18, Jer. 22:24, Ezek. 5:11, Zeph. 2:9, etc. ), and applying it to Christ, the Apostle Paul self-consciously and deliberately calls Christ Jehovah. Note also that at the Judgment Seat of Christ, everyone will give account of himself to God. This passage is a powerful and unmistakable statement of Christ's deity. 2 Corinthians 5:10-"For we must all appear before the judgment seat of Christ; that every one may receive the things done in his body, according to that he hath done, whether it be good or bad." 2 Timothy 4:1, 8-"...the Lord Jesus Christ, who shall judge the quick and the dead at his appearing and his kingdom.... Henceforth there is laid up for me a crown of righteousness, which the Lord, the righteous judge, shall give me at that day: and not to me only, but unto all them also that love his appearing." angels (Col. 2:18; Rev. 19:10). God says, �I am YHVH: that is My Name: and My glory I will not give to another ... For My own sake, even for My own sake, will I do it: for how should My Name be polluted? and I will not give My glory to another.� - Isaiah 42:8 and 48:11. This is the crux of all debates concerning the Deity of Christ : He is worshipped, and that with His Own approval and the approval of the Father. He is often worshipped by Jews in the above passages - Jews who would never deny their monotheistic faith! How much clearer can it get? If this fact alone were all the proof I had for Christ�s Deity, I would be on solid ground. and the Word was God (1 John 5:20). 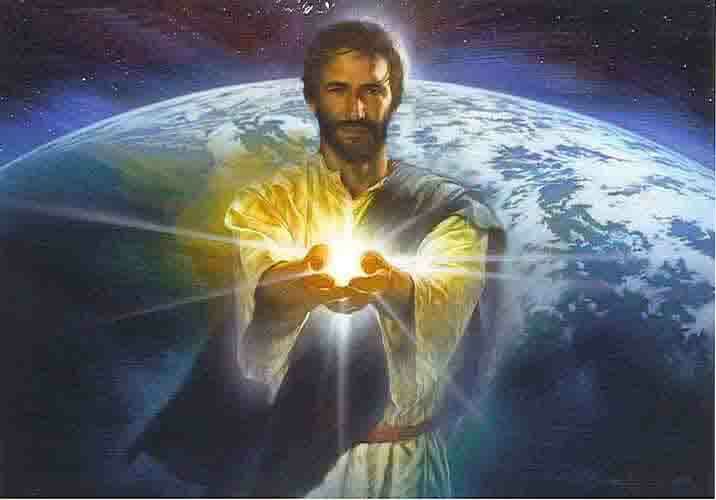 which lights every man that comes into the world (Psalm 36:9; Jn. 8:12; 9:5). full of grace and truth (cf. v. 17). Isaiah 7:14-"Therefore the Lord himself shall give you a sign; Behold, a virgin shall conceive, and bear a son, and shall call his name Immanuel" (Immanuel literally means "God with us"). Isaiah 9:6-"For unto us a child is born, unto us a son is given: and the government shall be upon his shoulder: and his name shall be called Wonderful, Counsellor, The mighty God, The everlasting Father, The Prince of Peace. Of the increase of his government and peace there shall be no end...."
Jeremiah 23:5-6-"Behold, the days come, saith the LORD, that I will raise unto David a righteous Branch, and a King shall reign and prosper, and shall execute judgment and justice in the earth. In his days Judah shall be saved, and Israel shall dwell safely: and this is his name whereby he shall be called, THE LORD OUR RIGHTEOUSNESS." Christ's name in Hebrew is YHWH Tsidkenu, Jehovah Our Righteousness. Micah 5:2-"But thou, Bethlehem Ephratah, though thou be little among the thousands of Judah, yet out of thee shall he come forth unto me that is to be ruler in Israel; whose goings forth have been from of old, from everlasting." Christ has always existed because He is not a created being; He is God Almighty who has existed from everlasting. Malachi 3:1-2-"Behold, I will send my messenger, and he shall prepare the way before me: and the Lord, whom ye seek, shall suddenly come to his temple, even the messenger of the covenant, whom ye delight in: behold, he shall come, saith the LORD of hosts. But who may abide the day of his coming? and who shall stand when he appeareth? for he is like a refiner's fire, and like fullers' soap." God's temple is Christ's temple. Christ comes as an all-powerful judge. Psalm 45:1, 6-7-"I speak of the things which I have made touching the king.... Thy throne, O God, is for ever and ever: the sceptre of thy kingdom is a right sceptre. Thou lovest righteousness, and hatest wickedness: therefore God, thy God, hath anointed thee...." The Hebrew word translated "anointed" is the verb form of the noun "Messiah." Psalm 110:1-3-"The LORD said unto my Lord, Sit thou at my right hand, until I make thine enemies thy footstool. The LORD shall send the rod of thy strength out of Zion: rule thou in the midst of thine enemies. Thy people shall be willing in the day of thy power...." The LORD (Jehovah) will subdue all Christ's enemies. Yet Christ's rod and Christ's power will subdue all enemies. Christ's rule and power are clearly equal to God's. See Psalm 2:11-12 where a similar theme is discussed: "Serve the LORD [Jehovah] with fear, and rejoice with trembling. Kiss the Son, lest he be angry, and ye perish from the way...". Note how "the Son" is set poetically in parallel with "Jehovah." Aother line of proof of the absolute Deity of our Lord is found in the way in which the name of Jesus Christ is coupled with that of God the Father. In numerous passages His name is coupled with the name of God the Father in a way in which it would be impossible to couple the name of any finite being with that of the Deity. We have time for but a few of the many illustrations that might be given. A striking instance is in the words of our Lord Himself in John 14:23 where we read, "Jesus answered and said unto him, If a man love me, he will keep my words: and my Father will love him, and we will come unto him, and make our abode with him." Here our Lord Jesus does not hesitate to couple Himself with the Father in such a way as to say "We," that is, God the Father and I, will come and make our abode with him. In John 14:1 He said, 'Let not your heart be troubled: ye believe in God, believe also in me." If Jesus Christ was not God, this is shocking blasphemy. There is absolutely no middle ground between admitting the Deity of Jesus Christ and charging Christ with the most daring and appalling blasphemy of which any man was ever guilty. Our Lord Jesus says in Matthew 11:28, "Come unto me, all ye that labour and are heavy laden, and I will give you rest." Now any one that makes a promise like that must either be God, or a lunatic, or an impostor. No one can give rest to all who labor and are heavy laden who come to him unless he is God, and yet Jesus Christ offers to do it. If He offers to do it and fails to do it when men come to Him, then He is either a lunatic or an impostor. If He actually does it, then beyond a question, He is God. And thousands can testify that He really does it. Thousands and tens of thousands who have labored and were heavy laden and crushed, and for whom there was no help in man, have come to Jesus Christ and He actually has given them rest. Surely then He is not merely a great man, but He is in fact God. Again in John 14:1 Jesus Christ demands that we put the same faith in Him that we put in God the Father and promises that in such faith we will find a cure for all trouble and anxiety of heart. His words are, "Let not your heart be troubled: ye believe in God, believe also in me." It is clear that He demands the same absolute faith to be put in Himself that is to be put in God Almighty. Now in Jeremiah 17:5, Scripture with which our Lord Jesus was perfectly familiar, we read "Thus saith the LORD; Cursed be the man that trusteth in man," and yet with this clear curse pronounced upon all who trust in man, Jesus Christ demands that we put trust in Him just as we put trust in God. It is the strongest possible assertion of Deity on His part. No one but God has a right to make such a demand, and Jesus Christ, when He makes this demand, must either be God or an impostor; but thousands and tens of thousands have found that when they did believe in Him just as they believe in God, their hearts were delivered from trouble no matter what their bereavement or circumstances might be. Again, the Lord Jesus demanded supreme and absolute love for Himself. It is clear as day that no one but God has a right to demand such a love, but there can be no question that Jesus did demand it. In Matthew 10:37 He said to His disciples, "He that loveth father or mother more than me is not worthy of me: and he that loveth son or daughter more than me is not worthy of me," and in Luke 14:26, 33, he says. "If any man come to me, and hate not his father, and mother, and wife, and children, and brethren, and sisters, yea, and his own life also, he cannot be my disciple. So likewise, whosoever he be of you that forsaketh not all that he hath, he cannot be my disciple." There can be no question that this is a demand on Jesus' part of supreme and absolute love to Himself, a love that puts even the dearest relations of life in an entirely secondary place. No one but God has a right to make any such demand, but our Lord Jesus made it, and therefore, He must be God. In John 10:30 the Lord Jesus claimed absolute equality with the Father. He said, "I and my Father are one." In John 14:9 our Lord Jesus went so far as to say, "...he that hath seen me hath seen the Father." He claims here to be so absolutely God that to see Him is to see the Father Who dwelleth in Him. In John 17:3 He says, "And this is life eternal, that they might know thee the only true God, and Jesus Christ, whom thou hast sent." In other words, He claims that the knowledge of Himself is as essential a part of eternal life as knowledge of God the Father. Revelation 21:6-7-"And he [Jesus Christ] said unto me, It is done. I am Alpha and Omega, the beginning and the end. I will give unto him that is athirst of the fountain of the water of life freely. He that overcometh shall inherit all things; and I will be his God, and he shall be my son." John 10:28-39-"And I give unto them eternal life; and they shall never perish, neither shall any man pluck them out of my hand. My Father, which gave them me, is greater than all; and no man is able to pluck them out of my Father's hand. I and my Father are one. Then the Jews took up stones again to stone him. Jesus answered them, Many good works have I showed you from my Father; for which of those works do ye stone me? The Jews answered him, saying, For a good work we stone thee not; but for blasphemy; and because that thou, being a man, makest thyself God. Jesus answered them,... If I do not the works of my Father, believe me not. But if I do, though ye believe not me, believe the works: that ye may know, and believe, that the Father is in me, and I in him. Therefore they sought again to take him: but he escaped out of their hand." Mark 2:5-11-"When Jesus saw their faith, he said unto the sick of the palsy, Son, thy sins be forgiven thee. But there were certain of the scribes sitting there, and reasoning in their hearts, Why doth this man thus speak blasphemies? who can forgive sins but God only?... [Jesus] said unto them, But that ye may know that the Son of man hath power on earth to forgive sins, (he saith to the sick of the palsy,) I say unto thee, Arise, and take up thy bed, and go thy way into thine house" (cf. Lk. 5:20-24). The scribes' theology was correct: "Who can forgive sins but God only?" Jesus didn't disagree with their conclusion; rather, through the miraculous healing He proved that He in fact was God and had the authority to forgive sins. There is no room left to doubt the absolute Deity of Jesus Christ. The Saviour in Whom we believe is God, a Saviour for Whom nothing is too hard, a Saviour Who can save from the uttermost and save to the uttermost. We should rejoice that we have no merely human Saviour, but a Saviour Who is absolutely God in all of His fullness and perfection. On the other hand, how black is the guilt of rejecting such a Saviour as this! Whoever refuses to accept Jesus as his Divine Saviour and Lord is guilty of the enormous sin of rejecting a Saviour Who is God. Many a man thinks he is good because he never stole, or committed murder, or cheated. "Of what great sin am I guilty?" he complacently asks. Have you ever accepted Jesus Christ? "No." Well, then, you are guilty of the awful and damning sin of-rejecting a Saviour Who is God. "But," you answer, 'I do not believe that He is God." That does not change the fact nor lessen your guilt before God. Questioning a fact or denying a fact never changes it, regardless of what Mary Baker Eddy may say to the contrary. Denying the Deity of Jesus Christ does not make His Deity any less a fact, but it does make the denier of His Deity guilty of awful, incredible blasphemous slander against the Lord God of Heaven. There is only one God. Jesus said in (John 10:30) I and my Father are one. Trying to explain God in human terms is only possible through what we know from His Word, the Holy Bible. The Bible gives us just what we need to know, and enough information to know that we can trust God with our lives, and believe His Word is true. The Bible clearly teaches that God the Father, and the Son of God, Jesus Christ are one. The deity of Jesus Christ is what separates true Christianity from the cults that hold to much of the other doctrine contained in the Bible. These cults have one other thing in common they discourage their members from reading the Bible except through the interpretation of their headquarters. Just reading the Holy Bible alone, the way God intends us to, sets people free from cults.